…their unique history, origin, culture, customs, rituals, language and lifestyle! 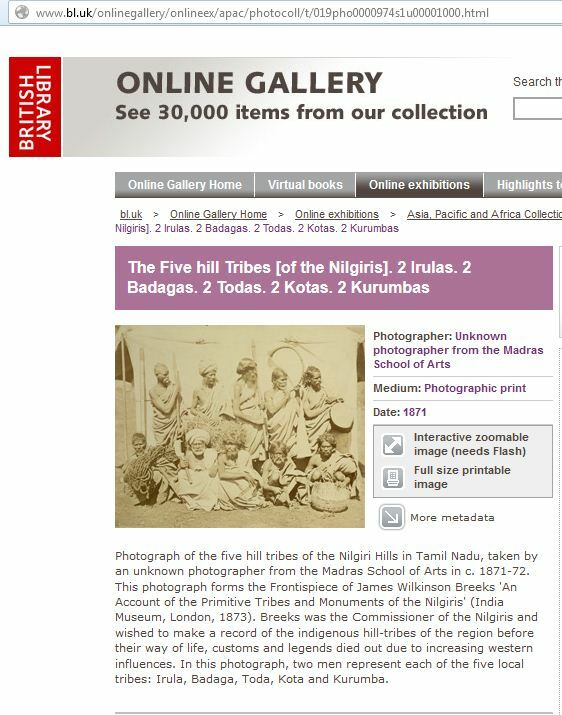 "Photograph of the five hill tribes of the Nilgiri Hills in Tamil Nadu, taken by an unknown photographer from the Madras School of Arts in c. 1871-72. This photograph forms the Frontispiece of James Wilkinson Breeks 'An Account of the Primitive Tribes and Monuments of the Nilgiris' (India Museum, London, 1873). Breeks was the Commissioner of the Nilgiris and wished to make a record of the indigenous hill-tribes of the region before their way of life, customs and legends died out due to increasing western influences. In this photograph, two men represent each of the five local tribes: Irula, Badaga, Toda, Kota and Kurumba". In Badaga,MOON is THINGUVA,Full Moon is "HUNNAWAY" & New Moon is "MUTTU"
WELCOME TO THE WONDERFUL WORLD OF BADAGAS! See more....in these websites ! Appara Santhosha - Thank you very much. Hadadha'ya - Is it there? Badaga dance is all about grace and style. It is a wonderful sight when a group of ladies dance together. Among the Badagas of the Neilgherry Hills in Southern India, when a death has taken place, the sins of the deceased are laid upon a buffalo calf.For this purpose the people gather round the corpse and carry it outside of the village. There an elder of the tribe, standing at the head of the corpse, recites or chants [known as - "KARU HARUCHODU"] a long list of sins such as any Badaga may commit, and the people repeat the last word of each line after him. Go here to listen to the song. Wg Cdr Bellie Jayaprakash, the 'All-in-One' of this site. Started as a hobby but now an obsession. This website crossed the milestone of 100,000 visitors on 8th March,2010, 150,000 visitors on 20th April,2011,200,000 visitors on 6th April,2012 and 250,000 on 22-1-2013. Namaskara - Greetings [Namasthe - Vanakkam], Ollengay Iddhaya? - How are you?, Ninna Hesaru A'ena? - What is your name?, Maduvay aagi buttava? - Are you married?, Nee a' hattigha koodidhe? - You are married to [the boy/girl from] which village?, Appara Santhosha - Thank you very much. COPYRIGHT: ©2006 - 2016 Bellie Jayaprakash. Watermark theme. Powered by Blogger.